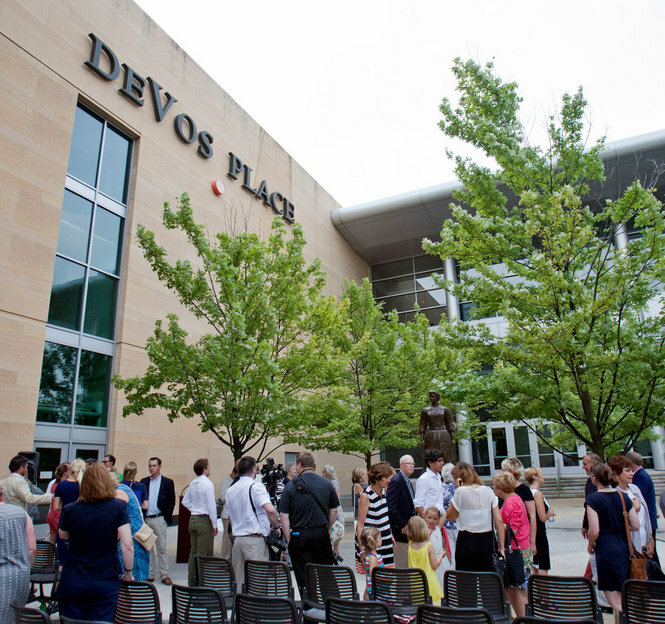 Last week, a new statue was unveiled in Grand Rapids, in front of the DeVos Convention Center, honoring former CEO of Bissell Corporation, Anna Bissell. The unveiling drew a small crowd consisting mostly of the business community, some descendants of the Bissell family and a few local politicians. The statue is part of the Legends series that has been spearheaded by businessman Peter Seechia, who is part of the Grand Rapids power structure. Anna, who was married to Melville Bissell, started as a sales person for the company, but took over in 1889 when her husband died. Anna Bissell ran the company until 1919 and remained chairman of the board until 1934. Anna was known as a progressive executive who showed concern for her employees, introducing innovative labor relations policies, including employee compensation, insurance, paid sick leave and pension plans, long before these practices were widespread. Even the Greater Grand Rapids Women’s History Council repeats the same mantra about Anna Bissell. In fact, Bissell is one of seven women that the Grand Rapids Women’s History Council features as women who Made a Difference. So what does it mean that Bissell introduced innovative labor relations policies? There is no evidence that a labor union was allowed to organize or attempted to organize at the company. The notion that paid sick leave and pensions plans were implemented “long before these practices were widespread, does not mean that the company engaged in such practices out of some benevolence. These policies were adopted at a time in the early years of the 20th Century, when organized labor was more radical and militant than at any other point in US history. The fact that the Bissell Corporation adopted such labor practices could also very well suggest that they by adopting such policies was a way to prevent workers from organizing. In looking at labor history sources in Grand Rapids, there is no mention of any attempts to unionize the Bissell Corporation. In fact, the only major history book on Grand Rapids that mentions anything about the Bissell Corporation is the book edited by Z. Z. Lydens, The Story of Grand Rapids: A Narrative of Grand Rapids, Michigan. On page 294, there is only reference to the company buying up other companies, thus expanding it capacity in business portfolio. However, there is another reference in Lydens book near the end, on page 637, which makes the claim that in 1900 Mrs. Bissell may have hosted the very first office part on New Year’s Day at her home on College Avenue. Bissell factory employees and their family were said to have attended. 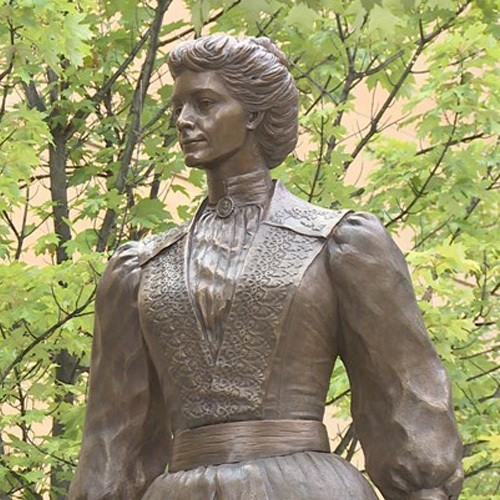 So, what can we make of the latest statue in Grand Rapids and the woman that it honors? Some will no doubt argue that Anna Bissell was breaking a glass ceiling, by becoming the head of a major company at a time when men ruled that arena. However, what could also be said is that Anna Bissell, the owner of a multi-million dollar company with global reach, made her wealth from the labor of those who worked in the factories. Lastly, the latest statue in the Legends series only proves that women can be good capitalists as well. 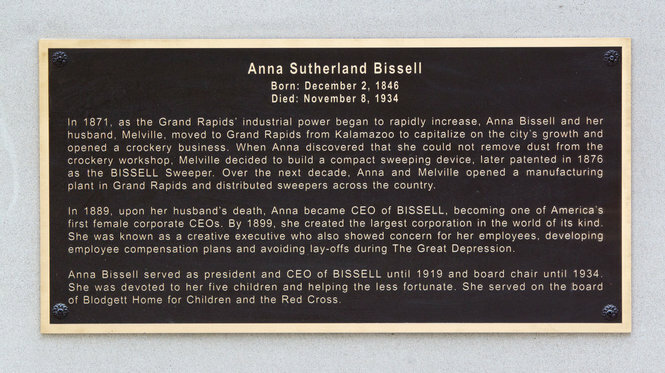 This entry was posted in Anti-Capitalism/Labor, Lies Across Grand Rapids and tagged Anna Bissell statue in Grand Rapids, Bissell Corporation, celebrating capitalism in grand rapids, Legends staue series. Bookmark the permalink.